“Grandma, Where Do Babies Come From?” from Christian Faith Publishing author Granny M is a wonderfully written tale that teaches the biblical story of creation to children. “Grandma, Where Do Babies Come From?”: delves into every child’s dilemma about humanity’s origins, ultimately shedding light on the genesis of the universe in scriptural context. 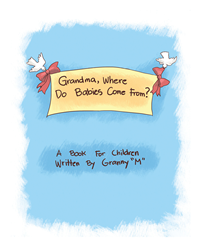 “Grandma, Where Do Babies Come From?” is the creation of published author, Granny M, an eighty-five-year-old woman with experience working with preschool children and kindergarteners. Published by Christian Faith Publishing, Granny M’s new book presents a simple yet in-depth explanation of the process of procreation for kids through a kid-friendly lens. Granny M’s masterpiece is a timely, relevant, and useful tool in teaching innocent minds about the idea of conception and birth without the touching upon the more adult aspects of it. View a synopsis of “Grandma, Where Do Babies Come From?” on YouTube. Consumers can purchase “Grandma, Where Do Babies Come From?” at traditional brick & mortar bookstores, or online at Amazon.com, Apple iTunes store, or Barnes and Noble. For additional information or inquiries about “Grandma, Where Do Babies Come From?”, contact the Christian Faith Publishing media department at 866-554-0919.